I do purchase coconut water on a fairly regular basis, because I enjoy the flavour, and also because I tend to drink a lot of water, and I know that it’s important to drink other liquids as well in order to maintain optimal salt, sugar, and mineral levels. I recently came across maple water at the store, and was wondering how it compares to coconut water. First things first: taste. 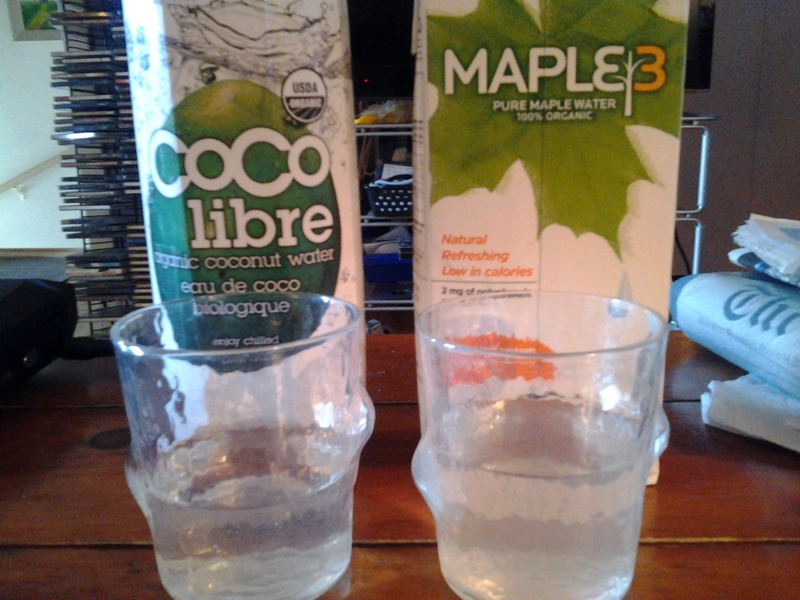 The maple water has a faint, sweet, maple sugar flavour, while the coconut water has a more aggressive, coconutty, base-ic flavour, which is more of an acquired taste. Next, sustainability: Considering that the maple water is from Quebec, while the coconut water is not (I’m not quite sure where the coconuts are grown, but I know that we don’t grow them here), maple water comes out ahead on the locavore scale. Aside from that, both products are completely natural, organic, and fair-trade. Maple water is the pure, undiluted sap of the maple tree, and carries a the special NAPSI (natural, authentic, pure, sterile, integral) certification developed specifically to assure the quality of maple sap. Because the sap is harvested in Quebec, a fair-trade certification is not necessary. Coconut water is the juice of young green coconuts, and Coco Libre carries a USDA organic certification. They do not carry a fair-trade certification, however, they do state, on their website, that they pay farmers a premium price for their coconuts and that “3% of the sales of [their] suppliers’ sales goes to a Partnership fund used for economic, social and environmental development, and fair trade promotion”. Finally, nutrition. Here is where things get a little bit complicated. Upon comparing the two via their nutritional fact charts, one can clearly see that maple water contains fewer calories than coconut water per serving. However, while the coconut water nutritional fact chart indicates that it contains potassium, sodium, calcium, phosphorus, and magnesium, the maple water fact chart gives almost no indication of its nutritional benefits. The front of the carton does boast that it contains 2% polyphenols per 250ml serving…but that is pretty much the only indication of its potential health benefits. 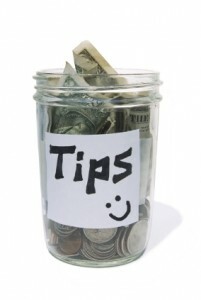 Additionally, their website is still not up and running, and as such, does not offer any additional information. So…what are polyphenols, anyway? According to Wikipedia, they “are a structural class of mainly natural, but also synthetic or semisynthetic, organic chemicals characterized by the presence of large multiples of phenol structural units”. Phenolic compounds also contribute to the sensory properties of foods (such as their colour and aroma). Okay, but why should I care about them? Well, because, as mentioned in this study, Polyphenols: Antioxidants and Beyond, “Polyphenols are the most abundant antioxidants in the diet”. The study goes on to say that “current evidence strongly supports a contribution of polyphenols to the prevention of cardiovascular diseases, cancers, and osteoporosis and suggests a role in the prevention of neurodegenerative diseases and diabetes mellitus”. Okay, so phenols are antioxidants, and are probably good for me…what about vitamins and minerals? In ‘The Chemical Composition of Maple Syrup’, David C. Ball states that “the two most common minerals in sap are potassium and calcium, found at concentrations of 26–75 and 8–56 ppm, respectively. Sap also contains trace (< 10 ppm) of magnesium, manganese, sodium, phosphorus, zinc, and copper.” Since one ppm is equivalent to 1 milligram of something per liter of water, this means that per cup, coconut water contains 530 milligrams of potassium while maple water contains between 6.5 and 18.75. As for calcium, coconut water contains 60 mg per serving while maple water contains between 2 and 14 mg. Coconut water obviously crushes maple water in terms of vitamin and mineral content. Additionally, coconut water also contains antioxidants in the form of cytokinins. These are a type of plant hormone that promote cell division, also known as cytokinesis. Two specific cytokinins found in coconut water, kinetin and trans-Zeatin, have been studied and found to have anti-ageing effects on human cells. So, after all that research, only two facts have become clear: for those in Quebec, or near there, maple water is the more sustainable (local) option, while coconut water packs more of a nutritional punch. Both are good products, so choose whichever you wish according to your needs…’Till next time…cheers!